Bright and quiet apart in Madrid City Center. Touristic apartment code VT-2324. Elevator, independent room, 2 bathrooms. Secretos is a cozy and bright apartment recently remodeled. It offers a large en-suite bedroom, a living-room with a double sofa-bed and a second complete bathroom. The apartment counts with all kind of amenities: elevator, air conditioning by pipes hot/cold, washing machine and dishwasher, microwave, TV and Wi-Fi. Small appliances such as iron, drier, coffee machine, kettle, etc. We have finely selected the decoration, combined with exposed open ceilings that will let you appreciate the timber beams, creating a cozy and functional ambiance. A perfect apartment to enjoy the charm of one of the most centrically placed and authentic neighborhoods of the capital. We will receive you personally, to welcome you and provide you with all information you need about both the apartment and the neighborhood. We will be available for and answer any queries you may have. Weekly house cleaning and towels&bed sheets change. Secretos is located in Cava Alta Street, a historical street located in the heart of La Latina, one of the most authentic neighborhoods of the capital. Its particular charm makes it one of the main destinations for both tourists and madrileños. The ancient streets are full of restaurants, where you can enjoy both the most traditional Spanish cuisine as week as the new cuisine. This area is one of the favorite places to eat some "tapas" after having visited El Rastro, the best well-known and biggest flea market of the capital. You will find all kinds of entertainment, as Madrid provides a huge cultural offer including several types of museums/theaters to enjoy during the day/afternoon. During the night, the pubs provide an animated nightlife, well known by the madrileños. Moreover, you just need to walk a few minutes to get to the main touristic points of the city such as Palacio Real, Plaza Mayor, Puerta del Sol, Gran Via, Mercado de la Cebada, Mercado de San Miguel, the Prado Museum, the Reina Sofia Museum and the Thyssen-Bornemisza Museum all in a radio of less than tem minutes walk. You also find the commercial area of Preciados if you plan to go shopping. You can get to all touristic places of the city centre on foot. Nevertheless, you can walk to the metro station La Latina (4 min, line 5), metro station Tirso de Molina (6 min, line 1) and Sol station (metro lines 1, 2, 3 and regional trains). You can also easily rent a bike in front if the La Latina metro station. Check out: up to 11 am. Flexibility with this timing depending on the availability of the apartment. Check in between 10 pm and mid-night have an extra charge of 30€ to be paid in cash at your arrival. Please do not smoke inside the apartment. If so, do it in the windows. Please let the apartment clean and in a tidy state. Please do not organize parties inside the apartment. It is very important for us to keep a good relationship with the rest of neighbors. Alvaro and Angela: passionate for learning new countries and cultures. Having traveled inside and outside Europe every time we have had the chance, we find ourselves open mind and communicative. We welcome you with enthusiasm to our city! Being Madrid my home city, I always wanted to have an apartment to return to. I have been living abroad for the past 7 years, and I bought this apartment in the most charming and authentic area of the city. This apartment will make you feel at home. All travelers are amazed about how well catered the apartment is with every single detail, and guests marvel to find in a place where so much information is provided about the neighborhood (restaurants, bars, touristic places, basic amenities, etc). Public parking 400 m from the partment (Plaza Mayor). Shampoo and bath gel included. Wide and comfortable sofa-bed for two persons. Olive oil, salt, sugar, teas. Guide of the apartment and neighborhood in English made by us. Weekly house cleaning and change of bed clothes and towels included. Parking not included. Public parking Plaza Mayor and La Cebada close to the apartment. The apartment is located in the heart of the La Latina neighborhood. It's walking distance to the Royal Palace, Plaza Mayor, Mercado San Miguel, and many other sights. It's a vibrant neighborhood with many restaurants to choose from. We had a wonderful time in Madrid. Thank you, Alvaro. The apartment was very comfortable. Apartment is perfectly located on quiet street within walking distance of the Prado, the Royal Palace and all points in between. It's about 100 ft. from our favorite Madrid restaurant, Matritum. Apartment is extremely well supplied with all amenities we needed. Alvaro was incredible host, both before and during our stay. He accommodated quirks in our schedule, responded promptly to our concerns and helped make our visit to Madrid most enjoyable. Great place! Very close to everything. La Latina is a great area. Apartment had all the amenities. Although small, the flat is well-organized and has the best set-up and supplies for cooking of any shortterm flat we have ever rented: pots,pans, spices, utensils, coffee, teas, and so on. Same for the nice touches for the rest: candles, soaps, shampoos, lotions--like a hotel! And best of all: great location: just south of Plaza Mayor, but quiet on our street,--although lively as all get-out a block away! Comfortable, safe, clean apartment to relax in after a day in the city. 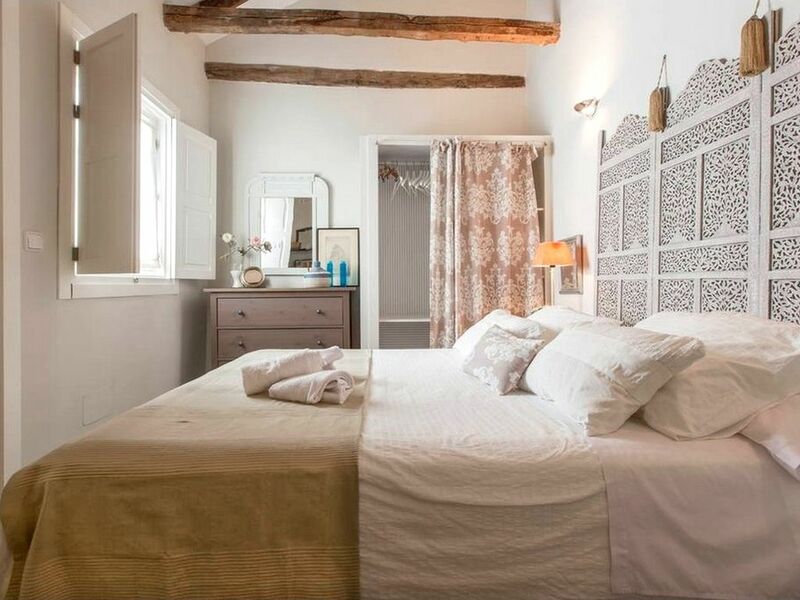 We enjoyed our stay at this charming, clean, homey apartment located on a quiet street facing an inner courtyard just a short walk from the La Latina and/or Tirso de Molina metro stops. This was a good spot to return to after a day out in the city. The bed was comfortable and clean; the bathrooms were compact but spacious. The shower was a bit drafty without a door, but we visited in late Nov/early Dec, so the air was generally cooler during our stay. Heating worked very well. Great natural light and windows helped to brighten, ventilate, and cool down the apartment. We appreciated the stocked teas/coffee and water kettle and took advantage of the kitchen space to prepare breakfasts and a few light evening meals during our visit. Plenty of outlets and decent WiFi signal throughout the apartment. Thank you to Alvaro for the binder of info with some local recommendations for shops, dining, markets, etc. Would recommend! Great apartment, quite and central to everything. Never needed to use public transportation! It was very clean and had everything one would need. The street below had more restaurants than my entire hometown! Loved it. Weekly house cleaning and change of bed clothes included. Limpieza de la casa y cambio de toallas y sábanas una vez por semana incluido.